Changing habits won’t be easy, but it will be worth it. Start by completely removing unhealthy or non-nourishing foods and snacks from your home. Get rid of soda, foods containing artificial sweeteners and coloring and other “junk” food and stock your fridge and pantry with lots of fresh, nutritious items! 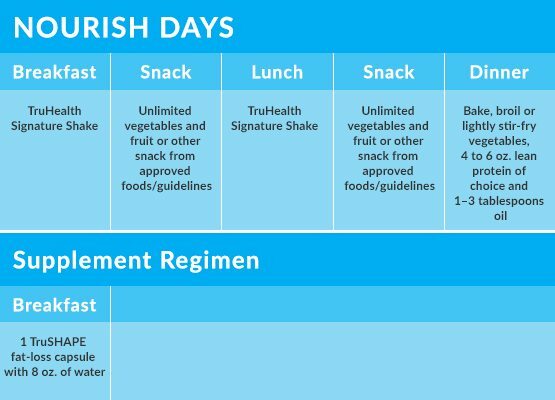 While following the TruHealth 30-Day Fat-Loss System, you’ll want to make some good everyday eating choices to complement the program. Although we don’t “calorie count” in this program, keep in mind that it is important to manage your caloric intake to manage your body composition. Eating real, whole foods, limiting sugar, consuming good fats and getting an adequate intake of protein are all good ideas to follow. You may find the following dietary suggestions to be a change from some of your normal habits, but with a little preparation and planning, you should be able to quickly and easily integrate these ideas into your healthy lifestyle. Consume 3–6 servings a day of healthy fats (one tablespoon of oil or ½ medium avocado is equal to 1 serving of healthy fats). These can be used for cooking, for salad dressings or to go with your vegetables. Drink plenty of water every day (32 to 48 oz. 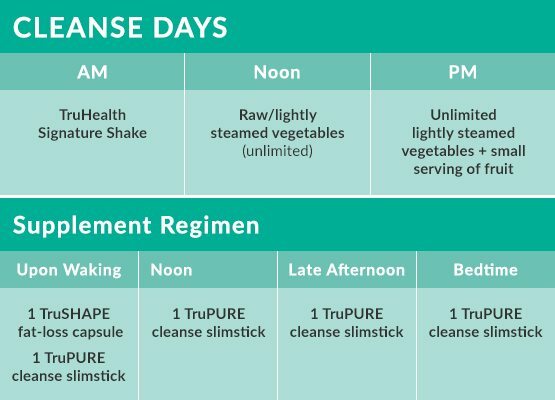 minimum on Cleanse Days). Eat 4–6 oz. of cooked lean protein (animal or vegetable). When cooking, broil, bake, roast or grill. Select quality-sourced meat and fish whenever possible. Include 1 serving of non-gluten grains (average serving size for grains = ½ cup cooked). Eat an unlimited amount of vegetables and fruit. OPTIONAL: Include small serving of non-gluten grains such as quinoa or sorghum (average serving size for grains = ½ cup cooked). Caffeine may be allowed and should be limited to no more than 1–2 cups a day on Nourish Days. For the Cleanse Days, we recommend no caffeine. We know most look forward to a cup of coffee or tea each day, so in order to help turn that daily cup into an enjoyable, healthy and even fat burning support, please see our recipes and tips. 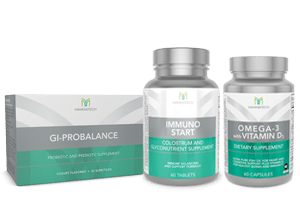 The TruHealth Fat-Loss System supports and encourages a low-glycemic diet. This is not only beneficial for overall health, but it also reduces the risk of putting on pounds as fat. 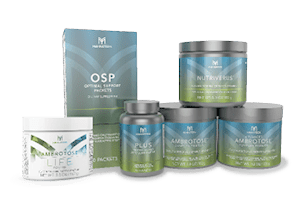 When eating a healthy, low-glycemic diet, food is slowly converted to glucose, which is absorbed into the bloodstream at a slow, consistent rate, where it serves as our energy source. On the other hand, high-glycemic foods are converted to glucose quickly by the body and then rapidly absorbed into the bloodstream. This spike in blood glucose can then trigger an insulin reaction. The more insulin that’s released, the more excess glucose that can potentially be delivered from your bloodstream to your muscle cells (some glucose is also stored in the liver, while the remainder is stored as fat). Depending on your activity level, your muscles may already be nearing their maximum glucose capacity. If this is the case—and it often is for many of us—much of your excess glucose is stored as fat. One of the main benefits of eating foods with a lower glycemic index is that it may help you cut cravings and urges by limiting spikes in your blood sugar. Some people believe that improper food combinations like proteins with starches may be one of the primary factors that cause gas, flatulence, heartburn and an upset stomach. Try experimenting by combining non-starchy vegetables (lettuce, broccoli, etc.) with proteins instead and write down the benefits. Your body composition is heavily impacted not only by what you eat, but also by how you move. If you are overweight, improving your body composition will require lowering your percentage of body fat and increasing lean muscle tissue. Exercise is a crucial component in successfully changing your body composition and in weight control because it burns calories. Here is the secret to fat loss: If you burn off more calories than you take in, you lose fat. It’s as simple as that. However, exercise has other beneficial effects that surpass the number on your scale. It helps every part of the body, including your mind. Exercise reduces stress, improves your mood, increases flexibility and strength and helps you sleep better. It can also keep you looking better (more toned) and feeling younger throughout your entire life. Although exercising is a great way to help maintain a healthy weight, exercising too much to lose fat isn’t healthy. Doing too much too soon or performing intense exercises on a daily basis could result in overexertion and injury. If you’re a beginner, start off slow and easy. Three days per week is probably a realistic, safe and effective plan. If you are experienced, then consider increasing your daily activity to maximize your fat-loss goals. Try to incorporate at least two and a half hours of low-intensity exercise (such as brisk walking, gardening or dancing) into every week. More intense activity (such as swimming, uphill hiking or power walking) can be added on a weekly basis. Moderate-intensity exercise can help you retain or gain lean muscle mass and strengthen weakening bones. A good plan should include stretching, cardio/aerobic exercise and weight lifting/strength training. Download some TruHealth exercise options by visiting library.mannatech.com/7818. If you are engaging in physical activity, depending on your age and level of intensity, you may want to increase your protein by adding OsoLean powder to your TruPLENISH Nutritional Shake. Extra protein will also help control hunger and may help you stay satisfied longer.